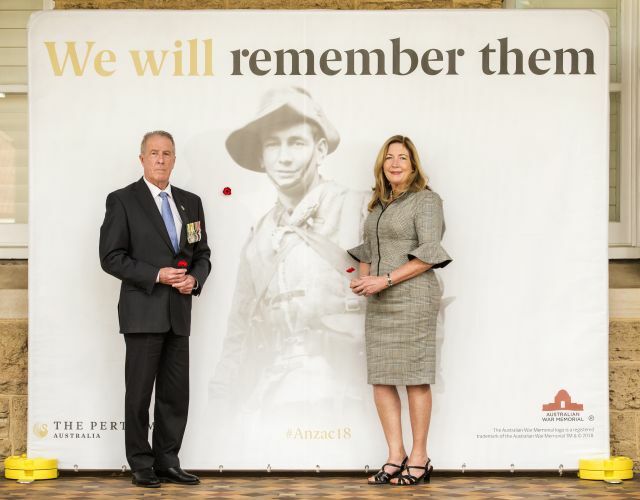 RSLWA chief executive John McCourt and Perth Mint group manager Alison Puchy place the first poppies on The Perth Mint centenary poppy wall of remembrance. PERTH people can honour Australian service men and women from today by placing a poppy on the Perth Mint centenary wall of remembrance. Five Perth Mint staff lost their lives fighting in both world wars and many more were wounded after 22 renounced their civilian duties to defend their country during World War I and 18 men served in World War II. Only 14 men returned to their former jobs. The Perth Mint has honoured them all with plaques set into its heritage building’s limestone facade. Perth Mint chief executive Richard Hayes said there was a sense of pride about its connection to the original Anzacs. The Mint will also mark the World War I centenary anniversary this month with the release of the final commemorative coins from its five-year Anzac Spirit 100th anniversary coin series. The commemorative wall will be up until April 29. The Mint will be open on April 25 from 12pm to 5pm and will offer complimentary admission to its exhibition for all active and retired military personnel.